“Casecation” (“all I ever wanted”) is one of those Brooklyn Nine-Nine episodes that fall under the high-concept, “Very Special Episode” classification. Episodes like “Moo Moo,” “The Box,” “Show Me Going,” or even this season’s “He Said, She Said” (also a Jake/Amy episode). These are episodes that tell universal stories—like the story of whether Jake and Amy can agree about children in their future—even when they’re more specifically about the world of the NYPD. However, “Casecation” has to go through an awkward, somewhat unbelievable set-up to tell a (necessary) story, as the majority of the episode hinges on the idea that Jake and Amy are just now talking about whether they want kids (Amy) or not (Jake). In this episode’s defense, it (and writer Luke del Tredici) are absolutely aware at just how ridiculous that is, as Terry asks the big question almost immediately when he enters the episode: “You got married without talking about if you want children?! ?” But that still doesn’t actually change the fact that Jake and Amy somehow, seriously didn’t have this conversation before, outside of a water park picture-based miscommunication. Had they had this conversation, it would have meant a big life decision occurring offscreen... but even that would have made more sense. Because the kid thing is definitely a conversation that needs to happen between these two; but it’s also one that sticks out like a sore thumb a year into these characters’ marriage. For it to never come up until now is absolutely unbelievable, when episodes like the aforementioned “Moo Moo” and “He Said, She Said” established that the characters weren’t exactly having first-time exposure to the conflicts within. In the case of “The Box” and “Show Me Going,” those character-specific plots were also treated as sometimes unavoidable parts of the job. So not only does “Casecation” make this a first-time discussion for Jake and Amy, the episode’s focus on the job is barely there except for during an extremely over-dramatic scene toward the end. With “Casecation,” you have to get through the pretty predictable beats—in terms of this particular story and the overall unimportant plot device that is the case—to get to the good material. In the case of this Jake/Amy story—besides the general concept that Jake/Amy never had a real conversation about this—of course Jake’s issues about potentially having kids stem from his “daddy issues” and problems tied to having a bad father. The previous episode was all about Jake’s need for therapy, after years of the audience noting things points like this. At this point, Brooklyn Nine-Nine has pretty much gotten all it can out of Jake’s daddy issues, including a disappointing half-sister in the form of the otherwise always welcome Nasim Pedrad. There is nothing surprising or even all that interesting anymore about these issues driving Jake’s decision not to want kids. The episode does, however, land on the more general concept of Jake being “scared” of being a parent—and trying to work through that—and it works much better. As for the barely there (despite the episode’s setting) case, the Pam reveal is unsurprising—both because of her omnipresence and the fact she’s played by Julia Sweeney—though it’s unclear at the end if Pam was waiting to follow through on the mysterious, “Antonio Banderas type’s” orders from moment one or if she was given the suicide mission later. (There is a twist in the fact that her oft-mentioned son Bobby isn’t actually the criminal.) Pam’s talkative old woman shtick—a “Julia Sweeney type,” if you will—is part of what ultimately saves the “over-dramatic” bomb scene, as it humorously distracts from how overbearing the “serious moment” score is during the scene. That score almost completely undermines both Andy Samberg’s acting and Beth McCarthy Miller’s direction in this scene too, which are both far more convincing when it comes to how serious the situation is than the score itself. Sure, no one watching believes Pam will really end up blowing herself, Jake, and Bruno Rojas up, but that score makes it even more of a (bad) joke. Then so does the follow through on the whole case, as the episode places no emphasis on finding out who that “Antonio Banderas type” who promised to pay Pam $500,000 is or the fact that Rojas is still in a coma when it ends and Jake and Amy leave… despite the fact that the entire “casecation” is set in motion by the necessity of having Jake (and Amy) by Roja’s side when he wakes up. But at least the children argument is resolved, unlike the case part of the “casecation.” And it does so with a good balance of humor and serious discussion. That is what this episode zeroes in on, to the point that it is all A-plot, with plot-specific appearances by the rest of the Nine-Nine squad. There are Scully and Hitchcock in the cold open, with the former basically running the whole hospital—a point that somehow doesn’t come into play during the episode proper—and the latter functioning as Jake’s offscreen source about how children ruin marriages. Boyle sets up the “casecation” and tries to be part of it, but Jake shuts down that second part almost immediately. (Boyle—father of Nikolaj—then, notably, has no part in the Jake/Amy child debate.) But it is the second batch of squad members (Holt, Terry, and Rosa) that truly bring the funny to this episode and also move the children debate and plot along. And this is an episode that already starts the conflict off with funny: As much as the water park set-up for the miscommunication between Jake and Amy is an iffy one, the runner that follows is a solid one (especially with moments like Amy revealing to Rosa that she’s pro-water park and the eventual week-long trip). In terms of the actual debate-turned-argument about having children, Amy makes a good point about not wanting to wait until things are biologically too late for her, and as upsetting as it is, she makes an even better point when she introduces the mic drop concept of not wanting to “start over at 38.” Brooklyn Nine-Nine is far too much of a positive and optimistic show to actually have this conflict last longer than an episode or potentially break up Jake and Amy now that they’re married—unless Andy Samberg and Melissa Fumero end up having a behind-the-scenes feud—so of course Jake decides he does want children. 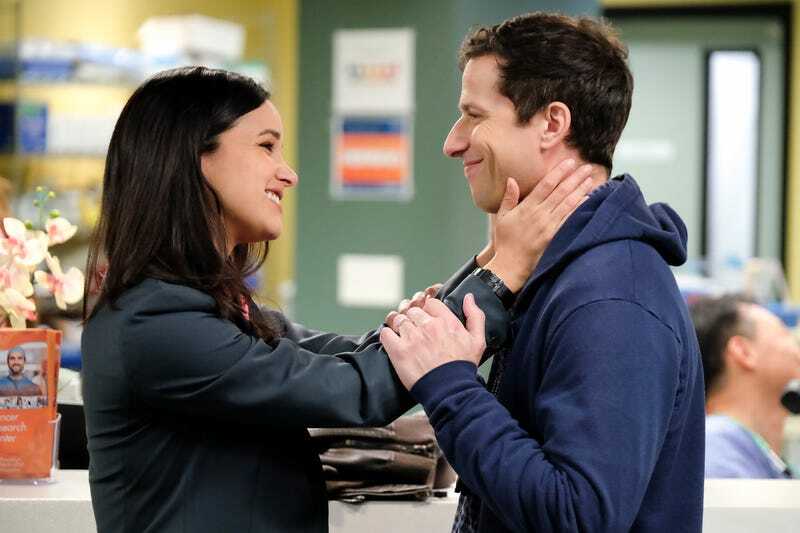 While there’s an interesting story in Jake still not wanting kids and Amy possibly settling for that, Brooklyn Nine-Nine is simply not that show. It doesn’t have to be anyway: The conflict here is still more believable than the idea of a Pam successfully blowing herself and Rojas up. Really, it’s the bookends that hurt “Casecation,” because it’s funny, honest, and necessary episode outside of that. It’s also a proper celebration of Jake and Amy’s one-year wedding anniversary that doesn’t feel like too much… even though there’s that whole pesky bomb thing. After a couple of weeks off for Abby’s to get the Will & Grace lead-in bump, Brooklyn Nine-Nine is back. I actually just spent the past week in the real Brooklyn. It was not as fun as this show makes it seem. Choose your jam: “Stake Me Out Tonight” or “Casecation”? My initial note about Pam—other than, “Julia Sweeney?! ?”—was, “From ‘It’s Pat!’ to ‘It’s Pam!’.” I’m sorry. In a nice touch, after telling Amy that her Ahmad Rashād impression sounds more like “an old witch,” Jake says that Pam—looking very much like an old witch—actually nails the Ahmad Rashād impression. I thought the January 6th flashback would lead to the reveal that Jake wasn’t actually the one who put Amy’s socks on her in the middle of the night. Instead, nothing. The blurry image of Jake and Amy wearing each other’s contacts honestly deserves a flashback more. So if Jake apparently didn’t want children going into this episode, I’m guessing he doesn’t realize what it potentially means to be Ava’s godfather. Somehow, there is no scene in this episode dedicated to Terry convincing Rosa to dance along to the “Casecation” song. She just shows up in the episode doing it, no expression on her face but with rhythm in her hands. The January 6th flashback was unnecessary! Nothing’s quite as funny as Holt listing off letters and numbers… until other characters start listing off letters and numbers. Jake: “I don’t wanna watch kids movies. I wanna watch movies for adults. Adults and teens!” And based on this episode, movies for adults and teens are Jupiter Ascending and Bumblebee, respectively. He makes a good point. Just to be clear—because this is still treated as untrue in pop culture—sometimes people simply, truly don’t want children, and that’s okay. Should Antonio Banderas be on Outlander?